The Arkham games are Batman at his best, combining intense action sequences against an iconic gallery of villains with exploration elements via his detective skills. The dark knight isn’t just about brute force, but uses his intellect to gain an advantage over criminals. I loved soaring through Arkham City and reliving Batman’s past through Arkham Origins. 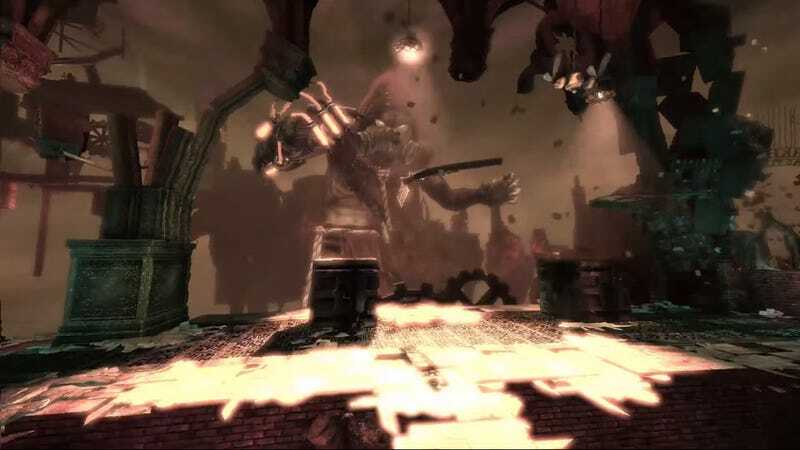 But Arkham Asylum still remains my favourite, in large part, because of the confrontation with Scarecrow. 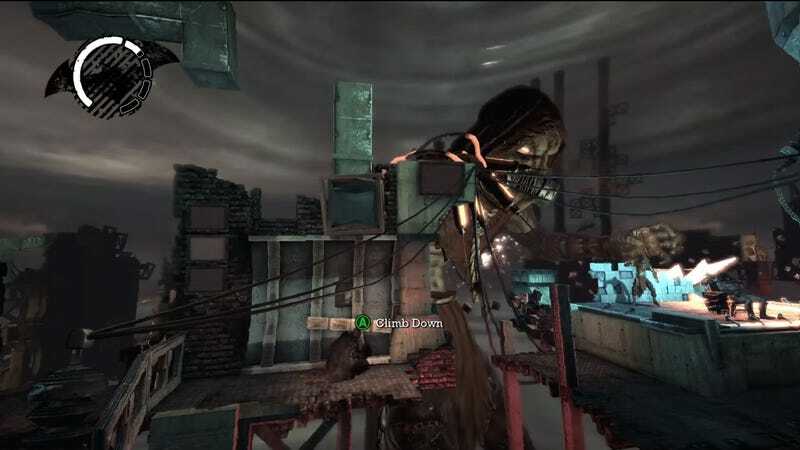 As part of my ongoing series examining some of my favourite levels in gaming, I want to delve into how Scarecrow’s nightmare sequences were a chilling and unique foray into the fractured psyche of Batman. 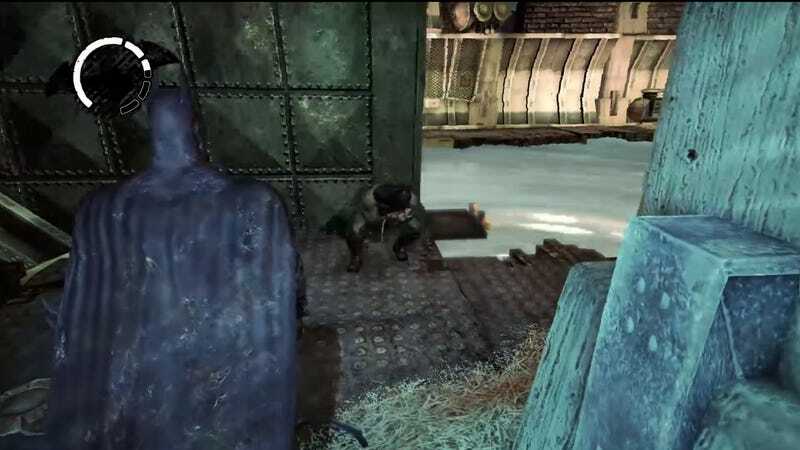 Batman’s journey into the madness of Arkham Asylum begins, as in most cases, with the Joker. The Joker takes over the asylum and unleashes the inmates to gang up on Batman. Scarecrow, the master of fear, is one of his cohorts. Is it failing to save the city or not saving Commissioner Gordon? Joker asks. Or is it, “Me in a thong?” Joker suggests as he bursts into maniacal laughter. The second of the scenarios seemingly comes true. 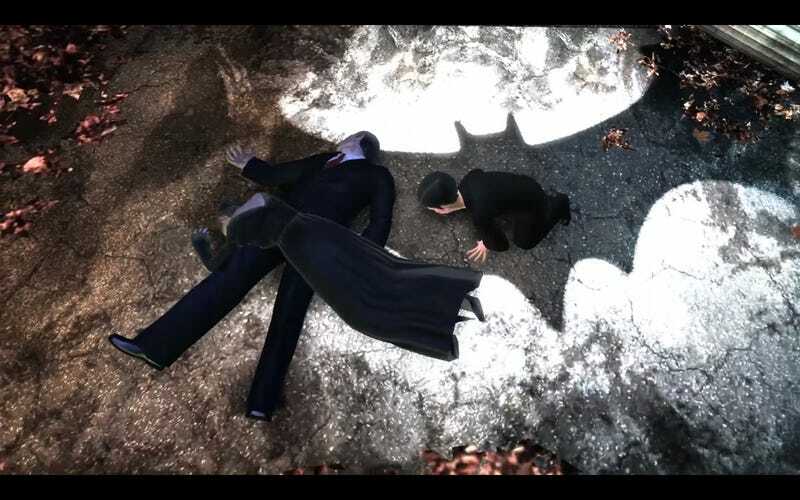 Batman finds Commissioner Gordon, but he’s already dead. “I’m sorry Jim,” he laments. But we, the players, get a sense something is awry as the shadow of Scarecrow pops up behind Batman before quickly vanishing. The dark knight tries to call Barbara to tell her the sad news about her father, but is told the number he dialled isn’t available. The whole pathway to the morgue starts to fall apart and bricks fall out of the walls. Roach-like blobs scatter and the sinister morgue is coldly empty when you enter. 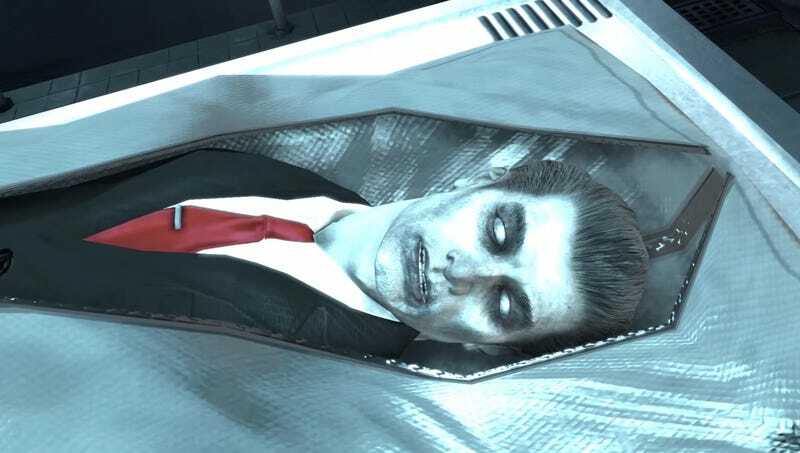 Batman turns around to exit back out to the hallway, but instead enters another morgue room and starts hearing voices in his head (never a good sign). There are three body bags and the first he unzips is of his father. “You should have stood up to him, son, like a man,” his father accuses him. The morgue transforms into a surreal nightmare. Parts of Arkham have been ripped out of place, hovering above a bottomless abyss. 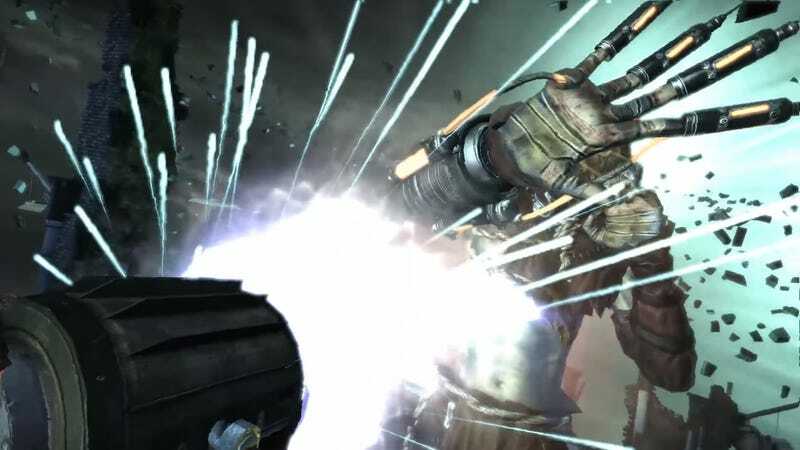 Scarecrow is enormous, wielding syringes as fingers, and wearing a gas mask with bright damning lights attached to his goggles as he scours the landscape for Batman. What does Batman fear? Joker earlier asked. We get a glimpse of it firsthand. The whole landscape is a twisted castle of decrepitude and Batman’s knighthood is being barraged by the overbearing monolith of the Scarecrow. Surprisingly, Batman doesn’t react in horror or shock when faced with these hallucinations. He acts as though this were business as usual. Scarecrow taunts him, “Poor little bat, you’re in my world now.” But this is actually Batman’s mind. Scarecrow’s lights are blinding and deadly, leading to an immediate game over if he spots you. Metaphorically, this seems to imply illumination is one of Batman’s greatest fears. Not about getting caught by Scarecrow, but exposing what he feels is his greatest sin. Failing his parents. To this day, their death haunts him. Batman, in many ways, tries to avoid their accusations using his equipment, hiding where he can, and warily navigating the bizarre landscape that’s as damaged and torn apart as he is. His psyche is a mental maelstrom that wracks him and pounds him with furious guilt. Without a single word of narrative, we learn how twisted Bruce Wayne is deep down. Just as light can kill Batman, pointing a light back at the Scarecrow with the symbol he hides behind, the Bat, helps wake him. The player would like to comfort themselves with the thought it was just an illusion. But the reality is that it was a manifestation of Batman’s true self. Two more encounters follow, each with a different focal point of Batman’s fear. The second encounter begins in his memories of Wayne Manor. It’s raining indoors, lightning flashes, and an interminable hallway turns into the old Crime Alley. Voices replay of the night his parents were killed. Outwardly, he remains stoic, just as an emotional war rages chaotically within. Only when he sees his parents on the ground does his movement stagger. 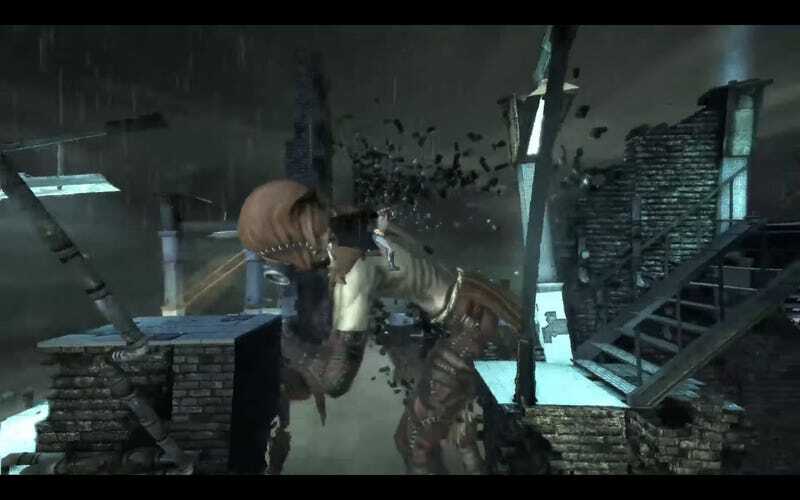 He stumbles to the ground, reliving the biggest trauma of his life. He is a kid again, remembering what Jim Gordon had said to him after their death. He asks Gordon why his parents were killed, and Gordon, the face of authority, well-intentioned as he is, has no answer. That’s when he turns back into Batman again. It’s not an answer to his parents’ death. Rather, a reaction, trying to impose order and meaning into their meaningless deaths. The giant Scarecrow is back. The wind howls, mourning music rings. Scarecrow searches the ruins, his psychedelic voice amplified by terror. Reanimated corpses attack Batman. He jumps through his floating archipelago of sorrow. Gears are floating in air, rotating like clockworks representing his desire to turn back time. “There’s no escape,” Scarecrow states, possibly as a threat, but more as a description of Batman’s unceasing remorse. The end is similar to the first. When the players continues, Batman rises from his own grave, inside the nightmare again. There are multiple projections of Batman in a mad and deranged state. Another Batman is savagely eating a rat on the ground in a pose reminiscent of one of my favourite Dark Knight story arcs, Venom. Batman’s conflict with his own sanity and despair are warping his consciousness. Joker and Scarecrow both suggest his place is in the Asylum alongside them. Batman rejects their intimation, but the vulnerability exposed through these nightmarish figures shows that his concerns about his own sanity linger. Joker, in many ways, represents a different reaction to the pointless violence of a sick world. Batman fights against it, trying to impose order through the cowl of the bat. The Joker embraces the entropy and revels in making the chaos worse. “Are you scared to come out and face your fears, Batman?” Scarecrow asks. The first spotlight causes Batman to break through the delusion, but Scarecrow injects him with more of the fear toxin. This only makes Batman angrier as he battles the skeletons and shoots another beam of light Scarecrow’s way, finally breaking the spell. In the end, Batman’s anger triumphs over fear, showing how the vigilante deals with his past trauma in a dark metaphor for the inner state of who he really is. It’s level design at its best, telling a story through gameplay while leaving us more disturbed than comforted. Will the Dark Knight ever find inner peace? Not within the walls of Arkham Asylum.